How can van der Waals forces help us make circuit boards? For today’s Chembite, we are going back into the depths of our Chemistry 101 textbooks to explore van der Waals forces and how they may have a larger effect on molecular dynamics than we had previously thought. You may remember van der Waals forces as the “weakest” of the types of atomic bonds, after covalent, ionic, and hydrogen bonds. These interactions arise due to the temporary dipole moments induced in all atoms and atomic structures randomly – as the dipoles fluctuate between two objects, any opposing dipoles will attract one another briefly, creating a temporary “bond” between the atoms or molecules. A larger molecule will have more fluctuations in its dipole, so the van der Waals interactions have a greater influence than on a small molecule. What else is there to discover about such a fundamental chemistry concept? Much of the work in this area is in creating more useful computational and mathematical models for molecular interactions. Researchers recently explored the theory behind an observation made several years ago: when a graphene sheet (a single honeycomb layer of carbon atoms) was inserted in between two interacting silica objects, the van der Waals forces were “switched off.”1 (Figure 1) This effect was likely due to the conductive nature of graphene, and these researchers are now interested in exploring how we can predict and take advantage of the properties of van der Waals forces. Figure 1. In 2014, Tsoi, et. al., studied the interaction between a silica atomic force microscopy tip and a silica slide. In control conditions (left), they measured the attractive van der Waals force between the silica objects. They observed no van der Waals interaction when a layer of graphene was placed in between (right). Reprinted with permission from Tsoi, et. al. ACS Nano 2014, 8,12, 12410-12417. Copyright 2018 American Chemical Society. The researchers compared two models to investigate the screening (or quenching) properties of graphene in between two silica sheets. The first is a simplistic but commonly used model which assumes the effects of van der Waals forces are additive – that is, they increase with the size of the molecule and aren’t significantly influenced by surrounding molecules. In this model, inserting graphene into the layers would cause more van der Waals interaction (Figure 2A). The second model is more complex and is based on key features of van der Waals forces described by theorist John Dobson. The most important of these features, and the one that explained graphene’s screening ability, was the electric field created by the fluctuating dipole moments (Figure 2B). 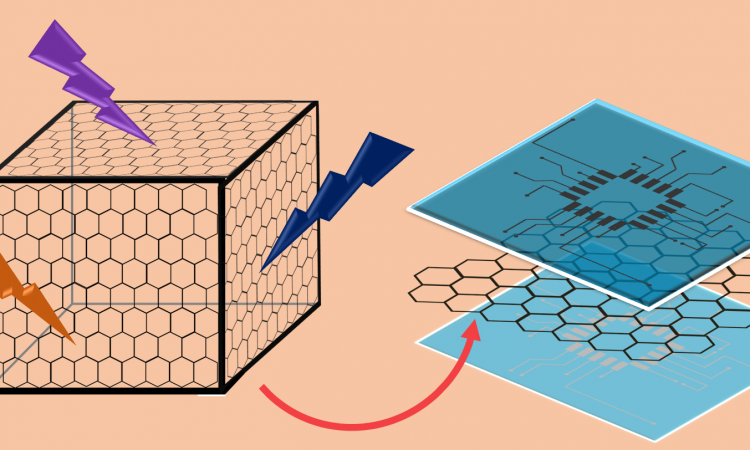 The researchers compared graphene’s effect of the van der Waals interactions to that of a Faraday cage. The metal surface of a Faraday cage prevents electrostatic charge from reaching the inside of the box by containing it to the conductive surface. The graphene works in much the same way – it prevents the electric fields generated by the induced dipoles of the silica from interacting by creating a conductive barrier. Figure 2. A comparison of the two models predicting van der Waals interactions. (A) The simple model assumes the van der Waals forces are additive, and do not accurately describe the experimental results. (B) The more complex many-body model takes into account the electric field induced by the dipole, and predicts the results seen in the lab. The graphene inhibits the van der Waals interaction. The simplistic additive model was not able to illustrate graphene’s screening effect, and this could be partially explained by the distance between the materials. The three layers were modeled at less than a bond-length apart, making these screening effects all the more extraordinary. That these short distances fit within the model suggests that van der Waals forces may be operating on scale shorter than bonds. Understanding the van der Waals forces at this scale could be useful as we build smaller and smaller devices. For instance, in building tiny electronics, graphene could be used as a grounding layer to prevent circuits from intersecting. Chemists are, of course, able to manipulate chemical bonds – otherwise we wouldn’t have spent all that time balancing chemical equations. Van der Waals forces are often thought of as the “uncontrollable” bond; based on this research, we may be able to manipulate van der Waals interactions as well. As devices are miniaturized, electrostatic effects and friction will become much more serious issues. Controlling van der Waals forces may be the key to unlocking those advancements.